The end of November is a dreary time of year in London, England. Autumn gales have stripped the trees of their foliage and the weather is cool and damp. Any precipitation is going to be wet and not the least bit white. Furthermore, this far North, sun rise is around 8am and dusk arrives somewhere around 3.30pm and that's if you can see it. This is the season of low cloud, mists and fog; admittedly not the "pea soupers" familiar to anyone who has watched a Sherlock Holmes film, they went with the introduction of the Clean Air Act of 1956. In the USA the same time of year heralds Thanksgiving, a festive season without much of an equal anywhere else, although Wikipedia claims the German Harvest Festival or Erntedankfest to be very close in spirit. It is a time for families to gather, count their blessings and be thankful for what they have, as the growing season ends and winter begins. For those lucky enough to live in, or near to, the high mountains, this provides a wonderful opportunity to head to the hills and get in the first runs of the new season. 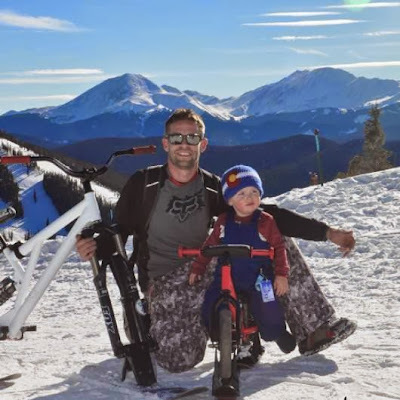 And this is exactly what Colorado resident and NISM team rider Brian Embick did with his son Wyatt Cash. Wyatt was riding one of the Strider Balance Bikes Skibike Conversions, as featured right here on the blog a year ago. The Strider kit uses plastic moulded skis, so to make things a bit more "grown up" Brian has added Salomon Grom 61cm SnowBlades, just about the shortest twin tip ski made with metal edges. And does Wyatt appreciate his dad's efforts, of course not, he was just 2 years old on November 20th and got his first day of riding in at the resort when he was still one! He even has his own season pass, valid at all epic resorts, including; Verbier in Switzerland, Arlberg in Austria and The 3 Valleys in France. They really take care of the kids here in Colorado, with free or cheap tickets, his was free because of age and my season pass purchase. 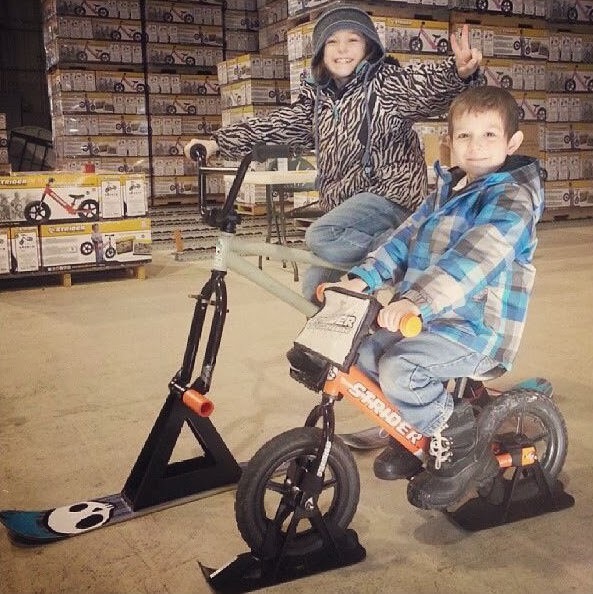 A day or so later Royce Alan McDaniel founder of NISM Ski Bikes posted this gorgeous picture of his kids showing off at Strider Ski Bikes. They both love ski biking and even his wife Charity has had a go and thought it was fun.